Former assistant manager Billy Stark expects Celtic to continue backing boss Ronny Deila even if they lose to Aberdeen at Pittodrie on Wednesday. A defeat would reduce the gap at the top of the table to three points and follow Celtic's League Cup exit. "It is a pretty bizarre situation where you are top of the league and still in the Scottish Cup and the pressure is being put on," said Stark. "But I think he appears to have the support of the Celtic board." 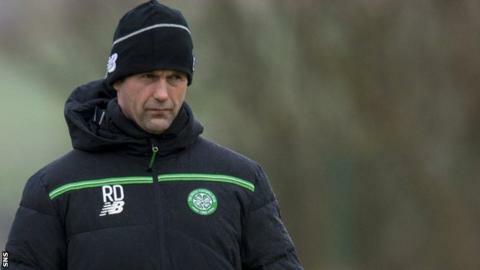 As he was named Scottish Premiership manager of the month for January, Deila himself told the media that he is confident of retaining support from the Celtic Park hierarchy. "That can change, but I don't see it changing whatever the result is in Aberdeen," Stark told BBC Scotland. However, the former Aberdeen and Celtic midfielder thinks that history shows the Glasgow side normally recover quickly from setbacks like Sunday. County came back from a goal behind at Hampden Park to defeat the League Cup holders 3-1 after the dismissal of defender Efe Ambrose. "Celtic have had a bad result on Sunday - obviously circumstances worked against him - but normally, in those circumstances, they do bounce back and I would expect them to do that," said Stark. "Equally, Aberdeen are on a strong unbeaten run and they will feel confident going into the game. "I wouldn't be surprised if it is a draw." Stark thinks an Aberdeen victory would prove they are genuine challengers to the reigning champions - but that a defeat would be a major blow to Derek McInnes' side. "I think, while it is mathematically possible, you could never say never, but I think it would be a very significant result if Celtic can win in Aberdeen, which would be no mean feat," he said. "Celtic have added to and strengthened their squad, as Aberdeen have. But Celtic have a big squad so you would still expect them to be favourites. "But, if Aberdeen win tonight, you must say there is a genuine title race there if there is only one result in it." Stark thinks the return to fitness of Celtic captain Scott Brown could be significant. Meanwhile, McInnes has suggested they will target Celtic's central defence, where Jozo Simunovic will be absent through injury, meaning a likely first start for new signing Erik Sviatchenko. "Scott Brown coming back can be very significant," added Stark. "He is a leader for them and a driving force in the middle of the pitch and that's the kind of thing they would like to introduce at Pittodrie I am sure. "I think Jonny Hayes and Niall McGinn are big, productive players for them and they need to be on their game for them in order to create chances because Celtic obviously have some defensive problems with Simunovic out. "Sviatchenko has had to come in and he's maybe not match fit and that is an area Aberdeen will look to exploit."